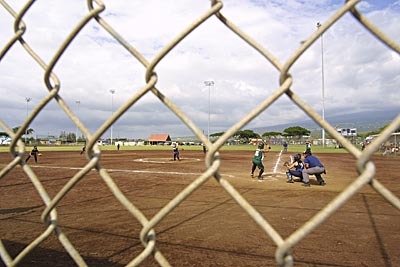 Shooting softball is always a hassle when you have to photograph the game from behind a chain link fence. You’ve got to follow the action, keep your lens centered in one of the diamond shaped holes in the fencing which is smaller than the front of the lens, and because I’m using the company’s gear and not my own I have to shoot everything on manual focus. I also have to keep my hand cupped over the front to throw a shadow onto the fence or it would show-up in the photos themselves. For photo geeks I also had to shoot pretty much wide open to avoid the fence in the photos. The old camera I’m provided with has a very slow, inaccurate autofocus, impossible to be used for any action (or even non-action events). Lucky for me I can still snap the focus controls manually like in the old days pre-autofocus. I aways have to roll my eyes when I read about younger photographers saying the autofocus of their cameras aren’t fast enough, I mean, just throw it into manual. This little doggie was tethered on the Konawaena side of the ballfield and it was a little bigger than you see it in this photo. The dog looked like a little toy bouncing around on the grass trying to get people’s attention to be played with. But this was a championship game so most of the attention was on the field. The doggie’s name is Coco.